Farrar Straus Giroux, 9780374102432, 263pp. We live in a world that is awash in visual storytelling. The recent technological revolutions in video recording, editing, and distribution are more akin to the development of movable type than any other such revolution in the last five hundred years. And yet we are not popularly cognizant of or conversant with visual storytelling's grammar, the coded messages of its style, and the practical components of its production. We are largely, in a word, illiterate. But this is not a gloomy diagnosis of the collapse of civilization; rather, it is a celebration of the progress we've made and an exhortation and a plan to seize the potential we're poised to enjoy. The rules that define effective visual storytelling much like the rules that define written language do in fact exist, and Stephen Apkon has long experience in deploying them, teaching them, and witnessing their power in the classroom and beyond. 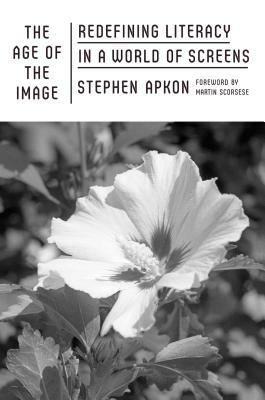 In "The Age of the Image," drawing on the history of literacy from scroll to codex, scribes to printing presses, SMS to social media on the science of how various forms of storytelling work on the human brain, and on the practical value of literacy in real-world situations, Apkon convincingly argues that now is the time to transform the way we teach, create, and communicate so that we can all step forward together into a rich and stimulating future. Stephen Apkon is the Founder and Executive Director of The Jacob Burns Film Center, a non-profit film and education organization located in Pleasantville, N.Y. The JBFC presents a wide array of documentary, independent and foreign film programs in a three theater state-of-the-art film complex, and has developed educational programs focused on 21st century literacy. Under Steve's leadership, the JBFC opened a 27,000 square foot Media Arts Lab in 2009. Since its doors opened in 2001, JBFC education programs have reached over 100,000 children.Steve serves on the boards of The World Cinema Foundation and Advancing Human Rights. He is President of Big 20 Productions; the director and producer of "The Patron, "a collaboration with Ido Haar; a producer of "Enlistment Days, "directed by Ido Haar; and a producer "of I'm Carolyn Parker: The Good, the Mad, and the Beautiful" directed by Jonathan Demme.